Please help bring her home! Sadie went missing from my front yard on the morning of September 5th at 9.30 AM. She was stolen from my yard. She is microchipped and is wearing her tags. She is very friendly but please do not chase her. If you bend down and wait she should come to you. I am offering a reward for her return. I am devastated. Please help bring Sadie home. If anyone has seen a person or child with a new white puppy, please email. Reward for info leading to her safe return. 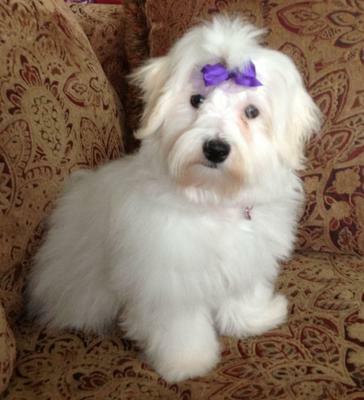 Any person bringing new white long haired puppy to be groomed, please email. I will reward any info to get my dog back. The area could be arendtsville, chambersburg, biglerville, shippensburg, Carlisle, gettysburg. Your plight tugged at my heart strings and I was afraid to check your post but I must say I am thrilled & over-the-moon happy to hear that you have been reunited with your girl.. Have a wonderful Holiday Season.. :-). I have tears of joy in my eyes!!! Thank God she is safe and I am so happy for you and her. Thanks for giving us the great news. I've been thinking about you and little Sadie ever since reading your first post. Thank God she was returned to you. I know how relieved and grateful you must be. I am so glad someone out there had the conscience to return her back to you, What a great ending to this story! Thank you for making my day and it's wonderful she is back with her family. Yes, that is definitely happy news. So glad you had a happy ending and that your little Sadie is safe and sound where she belongs. Thank God Sadie is found and safe at home! Keep her close, there are too many bad guys out there! Just a note of thanks for all the kind thoughts while my little Sadie was on the lamb. The person who took her from my yard brought her back in the middle of the night so they would not get identified. At 2 am someone put her in my back yard through the gate. It was weird but a happy day. Just wondering about your little Sadie, I truly hope you have found her and she is safe. Please let us know when Sadie is found! I don't know how to link this page to my facebook. Maybe it's a good idea to let the local news too. Good luck,We are sad for you and Sadie. I am so sorry about your Sadie! Are you watching Craig's List? There was a recent investigative news story on TV here where a dog had been stolen from the front yard. He was advertized on Craig's List and reporter found him. It seems a girl took him to sell him for money to buy food and diapers for her 3 young children (so she said). She was not the least bit sorry. But the lady did get her dog back. I wish you the best of luck and hope you post really soon that you got Sadie back. Be sure to check the animal shelters, too. I shared your post with a friend from Chambersburg. The more eyes the better. I'm so sorry--I don't know what I'd do if this happened to Sophie. I know how heart breaking this can be. I have family close to your area and I will let them know to keep a look out for her. Our prayers are with you. God Bless Lily. Our hearts and prayers are with you and hope you can get Sadie safely back home.........Please watch out for this little girl and give her mommy a call!!!!! I posted on my Facebook page and asked everyone to share the link, maybe somehow social media will help bring your baby home!!! Please everyone that reads this share the link on Facebook so it will get out to more people. Good luck! This story breaks my heart. I pray that someone returns Sadie back home to you. Praying you get your baby back. Hopefully someone will do the right thing.